Hurst, Texas, in accordance with state and federal laws, requires annual backflow testing of all backflow devices. This testing program ensures that the water system in Hurst is safe and pure and not polluted by backflow waste caused by backflow. 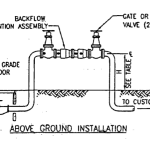 Backflow generally occurs when there is a sudden decrease in water pressure from the water source to the home or business; this drop in pressure, in effect, reverses the flow of water, causing polluted water to flow back into the city water supply. Thus, annual testing of all backflow preventers is required. City Backflow Testing is licensed and certified for all annual backflow testing by the State of Texas and the City of Hurst.